Despite the parliamentary recess and the typical tendency for tranquility in January, the beginning of 2018 has been quite hectic in the background of national politics, where there is neither break nor tranquility in election years. Leading up to former president Luiz Inácio Lula da Silva's trial date, many agents - political parties, jurists, specialists and popular segments in general - have spoken out in favor of the main arguments used by Lula's defense attorneys. In the general spectrum of the opposing parties, for instance, the main groups have taken a stand in the debate. Besides the Workers' Party (PT), which, naturally, is focused on the former president's defense, the Communist Party of Brazil (PCdoB), Socialism and Liberty Party (Psol), and the Democratic Labour Party (PDT) have criticized the Judiciary's posture towards the Guarujá's Triplex Apartment case, defending Lula's right to take part in the 2018 general elections. The Brazilian Socialist Party (PSB) has also spoken out on a similar line of thought, even though it has not stated a more direct defense for the former president. The Communist Party of Brazil (PCdoB), historic Workers' Party political ally, fully supports Lula. It is worth mentioning that it is one of the opposing parties that launched their own pre-candidate for president this year, but made sure to highlight the lawsuit's inconsistencies against the former president. 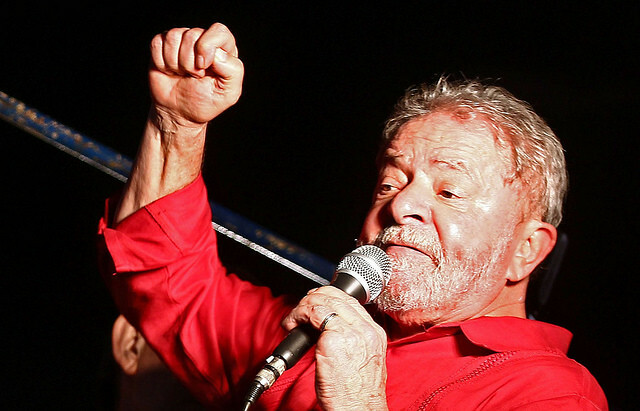 The party has publicly said that, regardless of the possible dispute against PT in the first round of the ballots, it considers Lula's candidacy a democratic, and, therefore, sovereign matter. Psol, opposing leftist party considered a little more radical, which resists Lula in certain focal points, has released similar declarations. However, even facing such differences, the party has been vocal in favor of the former president's candidacy. In the 13th of January, the party's National Executive published a statement defending the Workers' Party leader right to run the elections. In a conversation with Brasil de Fato last week, Psol's leader in the Lower House, congressman Glauber Braga (RJ), commented that this is an "intermediary" position within the party. He also said that the Judiciary conduct regarding Lula demonstrates, according to the party's point of view, a clear interference of Justice in this year's electoral-political scenario and that the party considers such behavior very dangerous to the future of the country. The party also sees Lula's trial as another attempt to consolidate the 2016 coup, which impeached president elect Dilma Rousseff (PT), especially due to the velocity with which the lawsuit has been dealt in the Court of Appeals (TRF4). Such speed in the Court of Appeals has also called public opinion's attention because it is considerably above the Judiciary system's average in general. Besides, the court also put Lula's case in front of other seven Car Wash appeals waiting for hearing. In conversation with other members of the party, Brasil de Fato found out that some members of its members believe that the national economic situation is the background for all the conflict surrounding Lula. Since the country is facing an administration whose reform agenda is dismantling the State and that serves the interests of very specific groups, their analysis is that any possibility of interrupting this project of neoliberal strengthening would represent a threat to the financial capital and other hegemonic groups. The Democratic Labour Party, party that is more or less situated within what is understood as left-centrist and which is allied to the opposition in some themes, did not release an official statement regarding the trial, but the national party leader, Carlos Lupi, has publicly declared in the last weeks that "one cannot turn the trial into a stage to destroy political images." Lupi also highlighted that the Triplex apartment case "is an example of everything that the Justice code forbids" and criticized judges who speak outside the court. The politician said that everybody needs to be treated with equality by the Judiciary branch and that the Federal Constitution guarantees that everybody is innocent until proven guilty. Another important figure from the party who is worth mentioning is the former minister Ciro Gomes, launched as pre-candidate for president. Last Sunday (21), he posted on his social media that he hopes Lula is acquitted. Ciro has shared the progressive politicians' opinion that the accusation against the former president would be fragile, and, therefore, without any substance to sustain a conviction. At last, the Brazilian Socialist Party (PSB), the closest party to the center within what is considered the left wing, has released a statement on Tuesday (23), declaring that there is a "certain level of abnormality" in the velocity of the proceedings of Lula's trial. The official statement highlighted that the "most proper political court is the popular vote, in direct elections."